The Sponsorship is $500 or more. You will be acknowledged with your name or company’s name, Logo and information on our website year around. 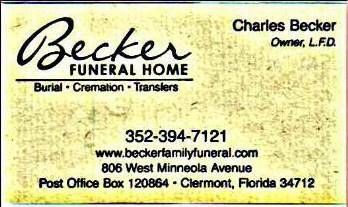 Becker Funeral Home has been a gracious sponsor of our Member Photography Show since the early 2000’s. With the sponsorship, we are able to award cash prizes in a number of categories to our amateur photographers. Thank you, Becker, for your continuing sponsorship.